Christine had the honor of attending the New York premiere of I Am Legend earlier this week, and scored a movie poster at the event. 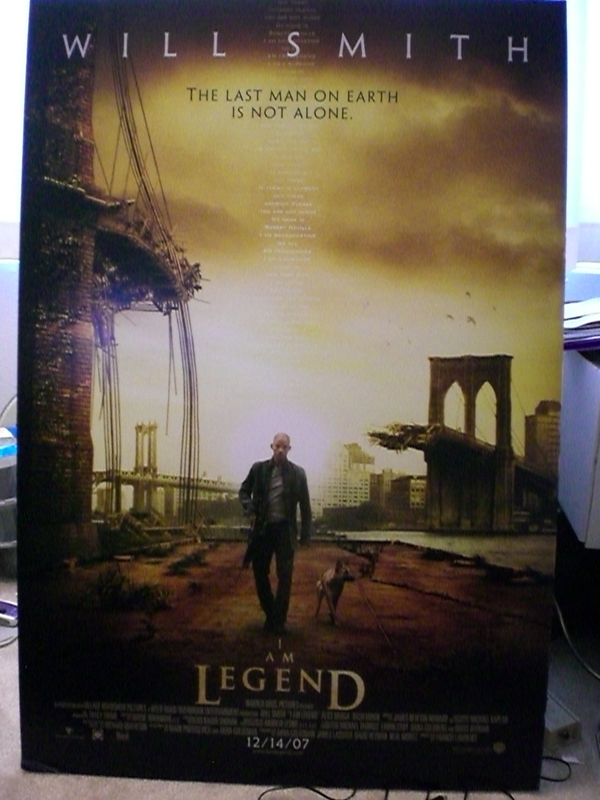 This I Am Legend poster can be yours, just by entering the contest below. The poster is on 1/4? foamboard, and is approximately 27? wide, by 41? tall. Don’t ask how we’re going to ship this to you, but we’ll figure it out. Sorry, contest has ended! Check back for the winner soon! We’ll select a random winner on Wednesday, December 19th, 2007. If you win, we’ll e-mail you asking where to ship your new poster. Good luck! Fine print: Contest is open to residents of the United States, and Canada over the age of 18. We will not sell your e-mail address for all the money in the world. We will not spam you, you will only receive a confirmation e-mail that we received your entry. I hope I win! Merry Christmas to all! Awesome poster. I haven’t seen the movie yet, but I will, despite what the critics say! This movie rocks hope I win. To mount this on my wall, something must go!